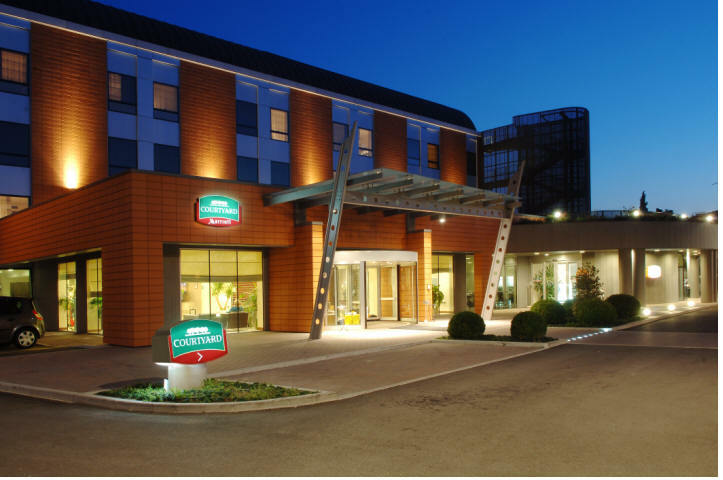 After your arrival you will be met by John, your tour organizer at either the Venice Airport or the Courtyard Marriott Hotel which is only 200 yards from the Venice airport. 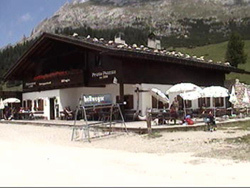 The pick up will be in the morning hours, and you will be transported by van or car to your hotel in Cortina. You will be taking the scenic route and stopping along the way for lunch. 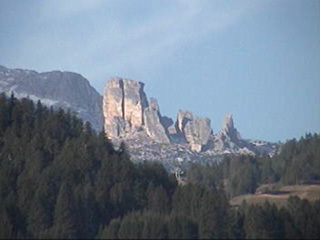 You will arrive in Cortina, which is surrounded by the beautiful Dolomite Mountains. After checking in at your hotel, you'll have time for Window shopping and exploration. This evening, you will enjoy a full course Italian meal at a popular restaurant for your welcome dinner! 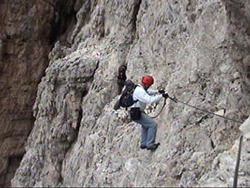 About 4 miles north of Cortina we will hike on a beautiful service road into Via Ferrata Barbara. 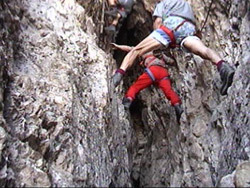 This Via Ferrate passes under a larder waterfall and goes down into a ravine. 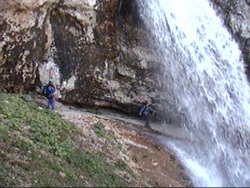 At the bottom, you will see an 80 ft. waterfall, cross a small bridge, and climb out of the ravine. After arriving back to the van or car, we will take a scenic road and head north to a mountain Rifugio for lunch (flower meadows). 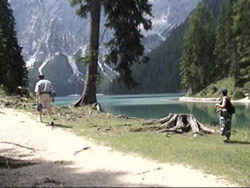 After lunch, we will go to Lake Braies near by for a beautiful walk around the lake. Then, we will go back to your hotel where you can rest and get ready for dinner. After eating a good breakfast, we will depart for Austria. We will go through Leinz, Austria, on our way to the Grossglockner, where we will see many beautiful towns and country sides. 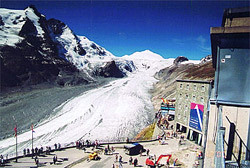 We will have lunch near the Glacier, and later we will take a short walk in the area, shop, and depart for Cortina, arriving just in time for our evening meal. 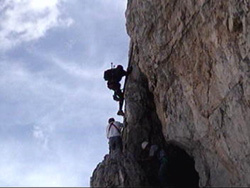 After breakfast, we will leave for our second Via Ferrata just 5 to 6 miles from Cortina. 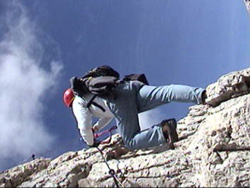 It is Via Ferrata Bianchi that is on the top of Mt. Cristallo (10,570 ft.). We will take a chair lift half way up and get another lift that is two hundred yards away. I call if the Egg Lift and you can see it on the FAQ page (at the bottom). 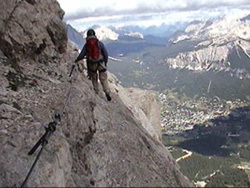 On the climb of the Via Ferrata Bianchi to the top at 10,377 ft. , you can see the town and the valley of Cortina. This is a beautiful view. 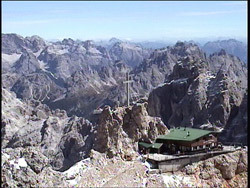 We will take our time and have our lunch and apple strudel at Rifugio Lorenzi 9,620 ft. There will be time in the day after arriving in Cortina, to do some shopping, etc, and I would be happy to help in any way. Just ask. Rest up and get ready for another nice meal. 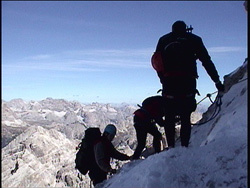 After breakfast, we will be going to the national park, about 17 miles east of Cortina, for a Via Ferrata. It is a beautiful hike into Rifugio Locatelli (8,040 ft), 2 miles, where the Via Ferrata Torre di Toblin (8,585 ft.) is close by. 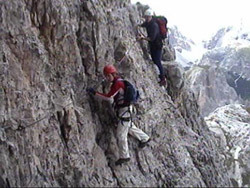 We will be passing the three peaks of Lavaredo, of which the highest is 9,852 ft. on the way to Locatelli. A lot of free climbing is done on these peaks. There are more than four Rifugios in the park and we will be eating lunch in one of them. We will definitely eat the apple strudel at Rifugio Locatelli because it is the biggest, best tasting strudel I have eaten so far in the Dolomite Mountains. Go to the bottom of the FAQ page and you will see the strudel. On our way back to Cortina, we will stop at Lake Misurina (5,760 ft.) to shop for souvenirs and take a small walk near the lake. Then we will get ready for dinner. Big Stretch on the "Toblin"
We will have breakfast and start our day in the direction of Passo Falzarego. 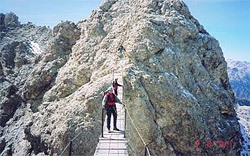 We will arrive at Rifugio Dibona (6,725 ft.) and hike up to Rifugio Pomedes (7,680 ft.) where the Via Ferrata Olivier (Punta Anna - 8,960 ft.) will start. From the top of the Punta Anna, we will go a litter higher to get to a place called "Bus de Tofana" (9,550 ft.) It is like a key hole that we will pass through to get to Rifugio Guissani (8,400 ft.), where we will have our lunch, and rest a little. 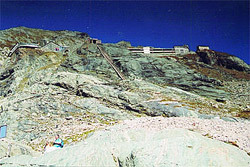 There is a 45 to 60 minute walk down to Rifugio Dibona, where the van or car is parked. 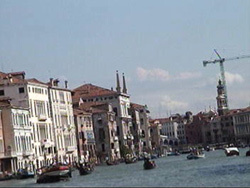 Returning to the hotel, we will pack for tomorrow's early departure and prepare for our farewell dinner.